It will take off from the Shevchenko University. 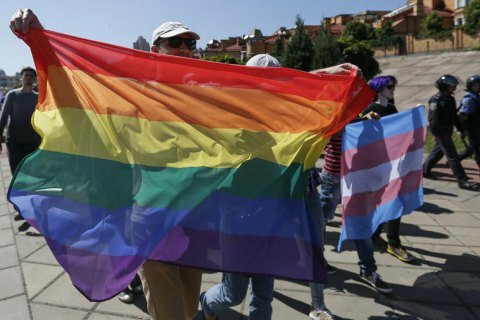 The LGBT pride parade will take off from the main building of the Taras Shevchenko University in Kyiv on 12 June, its spokesperson Khrystyna Morozova has told Ukrainian News. "Yes, it will start near the Shevchenko University. We will be gathering from 09:00 to 10:00. The march will start at 10:00," she said. In Morozova's words, the National Police will later explain the security arrangements and the itinerary of the march. On 12 June, the LGBT community is planning to hold the Dignity March in Kyiv. The ambassadors of 13 Western countries called on the Ukrainian authorities to ensure security and safety during the event. National Police chief Khatia Dekanoidze said that around 5,000 police troops and 1,200 National Guard servicemen would protect the march participants. Arterm Skoropadskyy, the press secretary of the radical Right Sector group, said the nationalists would turn the march into a "bloodbath" if it did take place. Last year's pride parade was attacked by several dozen youngsters, who seriously wounded a dozen of policemen.